One of the best parts of summer is sitting around a campfire. You can relax and enjoy the warmth with friends, getting cozy under the night sky with a couple of drinks. 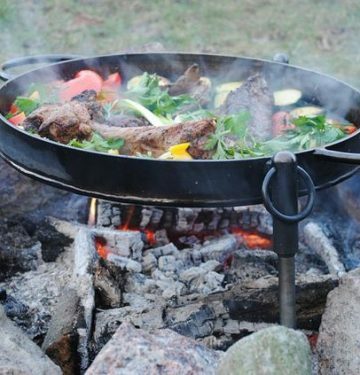 Firepits cook food so nicely – we all love that smoky flavor! – and keep us warm while warding off mosquitos. We’ve collected all kinds of beautiful fire pits for you to look at, reviewing the very best on the market. There is certainly one out there for everyone, no matter your lifestyle or available space you have. As you know, The Gnome gives the most thorough reviews. 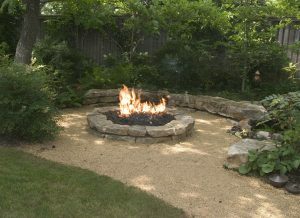 We’ll cover all kinds of details like how to maintain and care for your fire pit, as well the materials they’re made from and what that means for the durability and longevity of the fire pit. We’ll also hook you up with tips on cooking in a firepit, including types of wood to use, various tools and even recipes! There’s no better way to kick back after a long week than to sit around a fire with your buds. Fire pits are pretty easy entertainment. Fire is really just energy moving around and people love it. 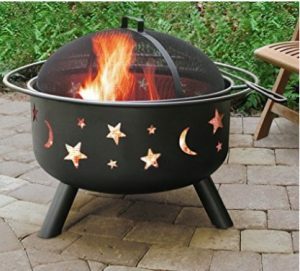 These fire pits are portable, unlike the in-ground fire pits your neighbours may have dug out. However, backyard firepits (in-ground pits) are illegal in some areas, whereas the free-standing firepits are not. They come with covers, too, making them safer since they have mesh grates to catch stray ash and embers.